Kiwi is almost the size of a chicken egg, with brown skin, green flesh, black seeds, and a white core. Kiwifruit has many benefits, many people love kiwis all around the world, there is some misunderstanding with the skin should be eaten or not. Basically, the skin of kiwi is fit to be eaten, but some people dislike its texture. Small size powerhouse! Kiwis are small in size and kiwis are squishy fruits, but their size is small but it's a power packed fruit. This amazing tropical fruit is packed with many nutrients such as vitamin C (a whopping 155% per 100 grams), vitamin A, vitamin B6, calcium, iron & magnesium that are very beneficial for your health. With many important benefits, it makes you healthy from inside, but kiwi fruit benefits your skin? If you don't know, then here are the best benefits of kiwi fruit, that you can add in your meals. Where does kiwi fruit belong from? Kiwifruit's other name is Chinese gooseberry, it's origin is in Chang Kiang Valley of China, in the 19th century It was recognized as the national fruit of China. The people of China were used to prepare a tonic from this fruit – it is that nutritious! But, it was some people from New Zealand who recognized the potential and benefits of this juicy and delicious fruit. They started cultivating it for their commercial purposes. The New Zealanders changed its name as the kiwi in 1959. After some years, in 1963-1964, this fuzzy fruit kiwi was first introduced in India. According to the reports of the researchers, the kiwi was started cultivated in the Shimla district and after some time spreads through the nation. At this time, China, New Zealand, Italy, Greece, Chile, and France are the number one kiwi cultivators all over the world. The flesh part of kiwi inside the fruit is a beautiful bright green in color, contains rich flavor (a mix of sweet and tart). The taste is very similar to a blend of lemon, honeydew melon, and orange. The fruit contains large numbers of black seeds in it that add a crunchy texture to this amazing fruit. Let’s take a quick look at the skin benefits of kiwi fruit. We all know how beneficial and important is vitamin C for our skin. And that is the only reason we buy expensive creams and serums that contain a high amount of essential vitamin. But, these are chemical-based products and can cause more harm to our skin than benefitting it. What can be more promising than eating a fruit that has been clinically proven to have around 93.2mg of vitamin C per 100 grams? Here’s how kiwi will help you keep your skin young, beautiful and vibrant. Vitamin C presented inside kiwis is an important ingredient required for the production of collagen. Collagen is a connective protein which is required for keeping the skin supple and firm. It helps in the healing of cuts. It also prevents the skin from becoming dry and rough. So, if are using a pack made up of kiwi in winters is a good way to say goodbye to the dry and scaly skin. Kiwifruit contains many antioxidants that remove the free radicals which stop the process of regeneration. It scavenges the free radicals to slow the signs of aging like fine lines wrinkles, age spots and dark circles. Kiwi is not a nutrient-rich fruit but also an amazing and best natural ingredient for your skincare routine in your daily life. It contains many skin-friendly nutrients like vitamins C and E and antioxidants. These are essential for rejuvenating your skin’s health. Unexpected pimples on the face are the worst mood-spoilers. Especially when you have to attend an event, and many creams are unable to mask the acne. Kiwi has anti-inflammatory properties in it. which help fight acne, by clearing the pores to prevent further breakouts. Applying fresh kiwifruit on the skin can treat various forms of skin inflammations like zits, pimples, and abscess. Kiwi has some important amino acids and vitamin C in it, that fight the harmful rays of the sun and prevent the sun damage. Actually, its cooling nature helps soothe the affected area. Place a few slices of fresh kiwi on the sunburned area on the skin for cooling skin treatment. 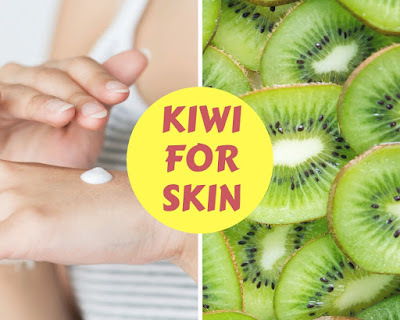 Kiwi fruit benefits for skin are extremely amazing because it has many properties like anti-aging properties in it, it removes the acne from your skin, rejuvenates the skin and makes your skin supple.